Your stenciled rays are so pretty! Love this card.....and I have those flat clear sequins too....love them! Amazing... I need those rays!!! Bright, fun card Karren! Love the stenciled corner rays with your large sentiment focal point. Great design! Thanks for sharing with us at CAS Stencil! You are such a rebel! I love the sunbursts in the corners, especially in these bright colors. And the black di3 cut adds some great contrast! Beautiful Karren. Your stenciling is awesome. Clever take on the sketch, Karren! I love your sponged sun rays and how you blended your inks to create dimension! 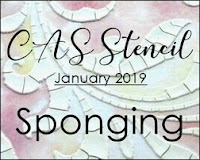 Loving your over-sized sentiment, too :) Thanks so much for adding your card to our gallery at CAS Stencil...I'm so glad you played along with us this month! Oh wow! This card is just amazing! I love those stencilled sunbeams and that sentiment is perfect! Love it!! Fabulous card, Karren! I love the way you stenciled the sunbursts and the sentiment not only fits perfectly with the rest of the card, but really pops in the black. Rogue...so funny!! I love your interpretation!! Perfectly sunny and, yes, amazing! Sorry I haven't been commenting as much....you know why and just know too that I'm always such a fan. Ha! I love rogue! Your card is really sweet - I love the die that you've used and the colours you've given it!